Mumbai : Eureka Forbes Limited health and hygiene company and the maker of Aquaguard, launched a TVC for the ‘Har Water Purifier Aquaguard Nahi Hota’ campaign. Aquaguard is synonymous with water purifiers in India through its innovations and many industry firsts. Through this TVC, the brand aims to create awareness among consumers about the benefits of ‘active copper ionic infusion’ and the need to drink copper-infused water for holistic growth. 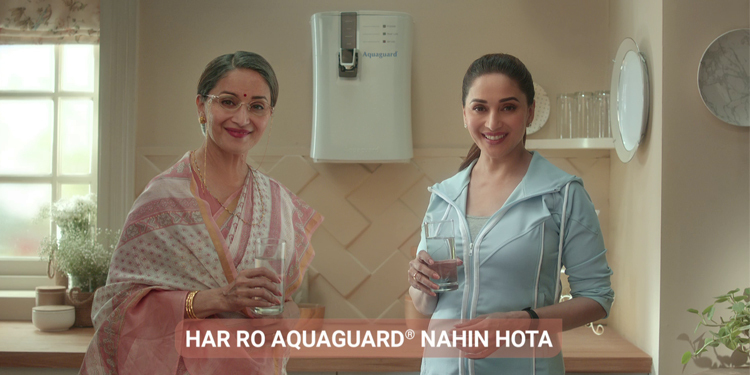 The ad plays on the generation-gap narrative, showing a conversation between Madhuri Dixit and her grandmother, with both agreeing on the science-backed belief that copper-infused water is good for the body. The campaign has been planned by Taproot Dentsu will be launched across all media channels and platforms.